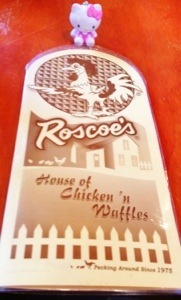 Hello Roscoe’s House of Chicken and Waffles birthday lunch! When it came to where to celebrate my birthday with friends, they chose to take me to a place I had never tried before. 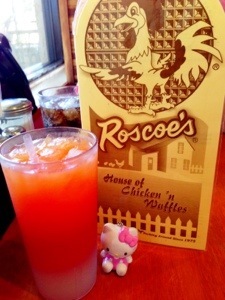 They took me out to Roscoe’s House of Chicken and Waffles. Since it was my first time ever to try this place out, I was quite curious how it would be. I love chicken and waffles and this place is well known for that. Several celebrities frequent it and it is so popular that both LA times and NY times have written about this place. One of the first things I noticed is that they have a variety of creative combo drinks with equally creative and cute names. They have a “sunset” drink with lemonade and fruit punch. It really looks like a sunset with it’s orange hue on top of the drink. They have a “sunsrise” drink with lemonade and oj. Similar to a sunrise, a bright yellow color sits on top of this drink. The drink I chose to get was the “eclipse” drink. The “eclipse” is a combo of lemonade, oj and fruit punch! I loved the cute color mix of this drink. It goes from red to orange to yellow in color. It is so pretty! I was delighted even more at first sip. It was a yummy drink that matched well with my entree. For my entree, I had no doubt in my mind that I was going to get chicken and waffles. It was only a matter of which chicken and waffle combo I wanted. I ended up choosing Scoe’s. It comes with a 1/4 chicken and 2 waffles. I asked for gravy on the side. I really enjoyed my entree. The fried chicken came out nice, hot and crispy. It was also good for dipping in the gravy. The waffle was so tasty and paired with the chicken. It was thin but big in size! They give two waffles! It was actually the waffles that were my favorite. It just had a good sweet flavor to it. A sweet treat to match the savory chicken. I found this place a nice place for good eats with good friends! The food is tasty and and very fulfilling. I’m super happy and thankful to my friends for treating me out to a LA hot spot that is world famous. 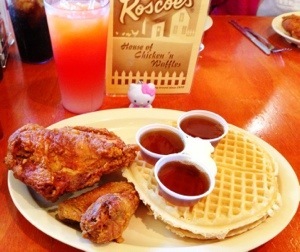 For more smiles, please my see my recent Yelp review on Roscoe’s House of Chicken and Waffles. Hello Thai Food to Go! 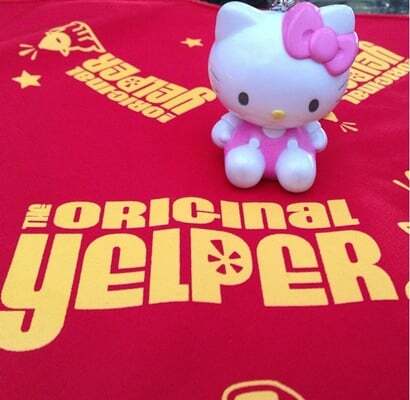 Hello Kitty Foodie meets Sanrio designer Misaki!